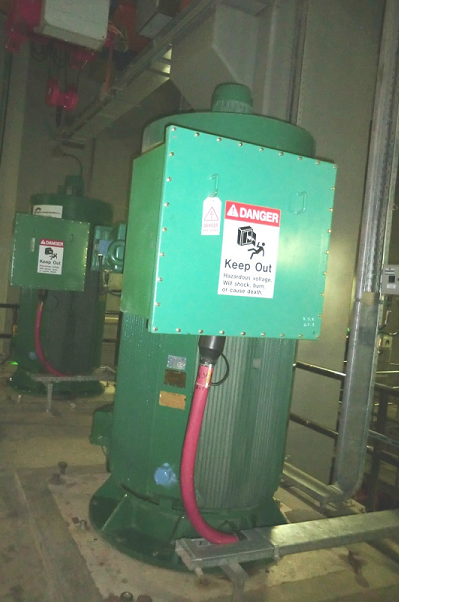 Last week I wrote a blog about cooling sewage pumps at a facility in Kuwait. The pumps in question were overheating and needed a way to cool the pump motors down to ambient temperatures. And, fortunately, our Super Air Amplifiers proved to be a great fit. On the other side of the same facility, there were control panels for 3.3kV pumps that were also experiencing an overheat condition. But, the motors were operating properly, it was the electrical panels that were tripping due to excessive heat. The overheating of the electrical panels would shut down the pump motors, bringing operations to a screeching halt. What the end user needed was a way to regulate temperature within the electrical panels that was small, effective, and easy to use. This application, and its requirements, were a perfect fit for our Cabinet Coolers. Cabinet Coolers are small, effective, easy to install, require no maintenance, and are incredibly easy to use – once installed and setup, they regulate themselves. By receiving a completed Cabinet Cooler Sizing Guide, EXAIR engineers are able to calculate heat load for an enclosure and recommend a suitable solution. If you have an overheating cabinet or electrical panel, call an EXAIR Application Engineer.